Cuba has won three of the four baseball gold medals. They wanted the Americans. 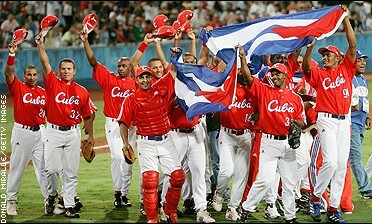 But the Cubans happily settled for a gold medal against another foe, pounding the upstart Australians 6-2 on Wednesday. Japan, which lost to Australia in the semifinals, settled for bronze with a win over Canada. Greece won for the first time ever in Olympic baseball Saturday night, getting 14 hits from its Greek-American lineup to beat Italy 12-7 in a showdown between the two weakest teams in the eight-nation tournament. The Greek Olympic baseball team has sufficient financial backing to go to Greece after working out next month in the United States, an official of the Baltimore Orioles said Saturday. The U.S. won't have an Olympic baseball team -- but Greece will. And it's a team full of ... Americans. The Colorado Rockies refused to let prized pitching prospect Jeff Francis go to Athens, which means Canada's Olympic baseball team is looking for a new ace. The Greek Olympic baseball team is so short of cash that it has no funds to return for the games after training in the United States, a top official said Friday. The defending champion United States baseball team failed to qualify for the 2004 Athens Olympics, stunned by Mexico 2-1 Friday in a qualifying tournament.